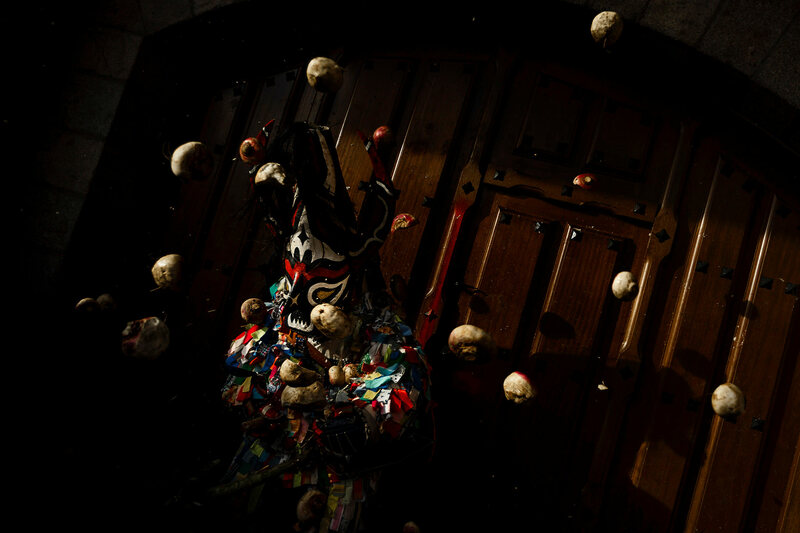 People throw turnips at the Jarramplas as he makes his way through the streets beating his drum during the Jarramplas Festival in Piornal, Spain, Tuesday, Jan. 20, 2015. Jarramplas is a character that wears a costume made from colorful strips of fabric, and a devil-like mask and beats a drum through the streets of Piornal while residents throw turnips as a punishment for stealing cattle. The exact origin of the festival are not known, various theories exist from the mythological punishment of Caco by Hercules, to a cattle thief ridiculed and expelled by his neighbors. Jarramplas Festival takes place every year from the 19th till the 20th of January on Saint Sebastian Day.